This is an abstraction of the various TLS implementations. Definition at line 30 of file tlsdefault.h. TLS client, verifying, available for all TLS implementations. Anonymous TLS client (non-verifying), available with GnuTLS. TLS server, verifying, currently not available. Anonymous TLS server (non-verifying), available with GnuTLS. Definition at line 37 of file tlsdefault.h. Constructs a new TLS wrapper. server The server to use in certificate verification. type What you want to use this TLS object for. Definition at line 41 of file tlsdefault.cpp. Definition at line 72 of file tlsdefault.cpp. Definition at line 108 of file tlsdefault.cpp. Use this function to feed encrypted data or received handshake data to the encryption implementation. Handshake data will be eaten, unencrypted data will be pushed to the TLSHandler's handleDecryptedData() function. data The data to decrypt. The number of bytes used from the input. Definition at line 100 of file tlsdefault.cpp. Use this function to feed unencrypted data to the encryption implementation. The encrypted result will be pushed to the TLSHandler's handleEncryptedData() function. data The data to encrypt. Whether or not the data was used successfully. Definition at line 92 of file tlsdefault.cpp. This function is used to retrieve certificate and connection info of a encrypted connection. Definition at line 136 of file tlsdefault.cpp. This functiopn performs the TLS handshake. Handshake data from the server side should be fed in using decrypt(). Handshake data that is to be sent to the other side is pushed through TLSBase's handleEncryptedData(). True if the handshake was successful or if more input is needed, false if the handshake failed. Definition at line 114 of file tlsdefault.cpp. Returns the state of the encryption. The state of the encryption. Definition at line 122 of file tlsdefault.cpp. Definition at line 130 of file tlsdefault.cpp. Definition at line 144 of file tlsdefault.cpp. 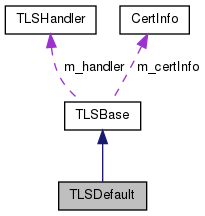 Returns an ORed list of supported TLS types. Definition at line 77 of file tlsdefault.cpp.